Is the CO2 effect saturated? The notion that the CO2 effect is 'saturated' is based on a misunderstanding of how the greenhouse effect works. The mistaken idea that the Greenhouse Effect is 'saturated', that adding more CO2 will have virtually no effect, is based on a simple misunderstanding of how the Greenhouse Effect works. CO2 absorbs nearly all the Infrared (heat) radiation leaving the Earth's surface that it can absorb. True! Therefore adding more CO2 won't absorb much more IR radiation at the surface. True! Therefore adding more CO2 can't cause more warming. FALSE!!! Here's why; it ignores the very simplest arithmetic. If the air is only absorbing heat from the surface then the air should just keep getting hotter and hotter. By now the Earth should be a cinder from all that absorbed heat. But not too surprisingly, it isn't! What are we missing? The air doesn't just absorb heat, it also loses it as well! The atmosphere isn't just absorbing IR Radiation (heat) from the surface. It is also radiating IR Radiation (heat) to Space. If these two heat flows are in balance, the atmosphere doesn't warm or cool - it stays the same. We have a water tank. A pump is adding water to the tank at, perhaps, 100 litres per minute. And an outlet pipe is letting water drain out of the tank at 100 litres per minute. What is happening to the water level in the tank? It is remaining steady because the flows into and out of the tank are the same. 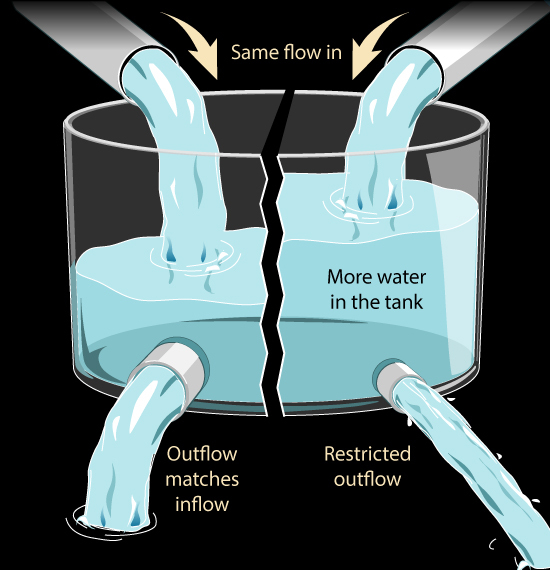 In our analogy the pump adding water is the absorption of heat by the atmosphere; the water flowing from the outlet pipe is the heat being radiated out to space. And the volume of water inside the tank is the amount of heat in the atmosphere. What might we do to increase the water level in the tank? But what if we restricted the outlet, so that it was harder for water to get out of the tank? The same amount of water is flowing in but less is flowing out. So the water level in the tank will rise. We can change the water level in our tank without changing how much water is flowing in, by changing how much water is flowing out. Similarly we can change how much heat there is in the atmosphere by restricting how much heat leaves the atmosphere rather than by increasing how much is being absorbed by the atmosphere. This is how the Greenhouse Effect works. 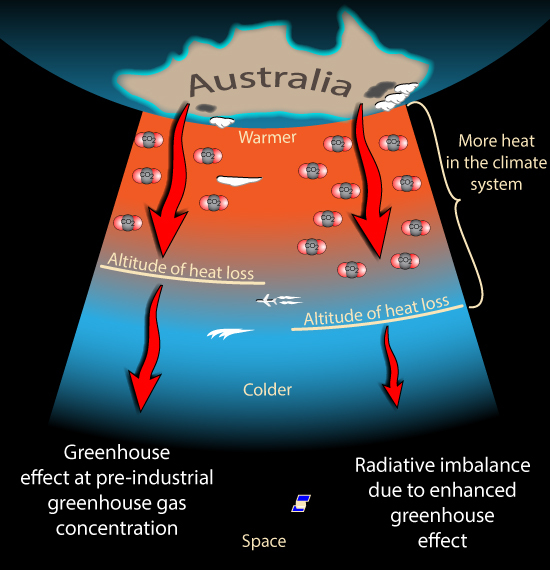 The Greenhouse gases such as carbon dioxide and water vapour absorb most of the heat radiation leaving the Earth's surface. Then their concentration determines how much heat escapes from the top of the atmosphere to space. It is the change in what happens at the top of the atmosphere that matters, not what happens down here near the surface. So how does changing the concentration of a Greenhouse gas change how much heat escapes from the upper atmosphere? As we climb higher in the atmosphere the air gets thinner. There is less of all gases, including the greenhouse gases. Eventually the air becomes thin enough that any heat radiated by the air can escape all the way to Space. How much heat escapes to space from this altitude then depends on how cold the air is at that height. The colder the air, the less heat it radiates. So if we add more greenhouse gases the air needs to be thinner before heat radiation is able to escape to space. So this can only happen higher in the atmosphere. Where it is colder. So the amount of heat escaping is reduced. By adding greenhouse gases, we force the radiation to space to come from higher, colder air, reducing the flow of radiation to space. And there is still a lot of scope for more greenhouse gases to push 'the action' higher and higher, into colder and colder air, restricting the rate of radiation to space even further. The Greenhouse Effect isn't even remotely Saturated. Myth Busted! The Skeptical Science website by Skeptical Science is licensed under a Creative Commons Attribution 3.0 Unported License.